Karan is a third year medical student at James Cook University. He has been the recipient of the GPSN First Wave Scholarship which gave him the opportunity to explore his research interests. He hopes to become a rural generalist when he graduates and has an immense passion for research. Aim: To determine the factors that influence Australian medical graduates to become general practitioners. Method: A literature review was conducted. Medline, PubMed and Cochrane Library were searched using the terms; “Australia”, “medical”, “graduates”, “interns”, “students”, “choice”, “specialty”, “general”, “practice”, “factors” and “influencing”. Results: The factors were grouped into intrinsic (age, gender, personality and skill set,) and extrinsic influences (lifestyle, income, stress, location and role models), with extrinsic influences regarded as the most influential. Most importantly, 72% of the Australian medical graduates viewed work culture as important, while 56% prioritised flexibility of working arrangements and hours of work. Conclusion: There are a variety of both intrinsic and extrinsic factors influencing medical graduates to choose General Practice over others. This can be seen as an opportunity for Australian workforce planners and policy makers to target the extrinsic factors with the aim of balancing the medical workforce to combat the shortage of rural general practitioners. In the field of medicine, a specialty is simply a specific study of medical science. Dermatology, Obstetrics and Gynaecology, Cardiology, Neurosurgery and General Practice are just a few of the vast array of medical specialties that medical graduates must decide between before embarking on a long, strenuous but nevertheless, highly rewarding journey. Students endure four to six years of medical school, only to begin a new journey as junior doctors. Internship is followed by residency, and the pathway after this depends upon the choice of specialty. Medical students and junior doctors are faced with the tough challenge of selecting a specialty. This review seeks to precisely identify the factors influencing medical graduates to undertake General Practice. This narrative review aims to explore the intricate complexities that invade the mind of medical graduates faced with the dilemma of choosing a specialty; in particular, what influences them to choose General Practice. The aims of this literature review are to highlight the spectrum of factors that play a role in medical students and interns choosing to undertake General Practice, and present medical colleges, recruitment agencies, workforce planners and national organisations with a platform upon which they can correct the imbalances in the medical workforce. This literature review covered recent literature that has focused on the factors influencing choice of medical specialisation (in particular General Practice) in Australia. Medical and social science databases were searched for publications from 1990-2013. Medline, PubMed and Cochrane Library were searched using these terms; “Australia”, “medical”, “graduates”, “interns”, “students”, “choice”, “specialty”, “general”, “practice”, “factors” and “influencing”. 7670 papers were identified through the database searches. These were then reviewed to only include studies conducted in Australia and concerning Australian medical graduates, which narrowed it down to 25 papers. 9 of these papers were excluded because they were not completely relevant to the topic. In addition, the bibliographies of articles were searched for further relevant publications. Studies referred to in this review vary widely and include both qualitative and quantitative studies. The primary influential factors involved in the selection of a particular specialisation can be separated into intrinsic and extrinsic factors. An individuals’ personal set of skills and the satisfaction they receive from using these skills are intrinsic factors which play a large role in influencing medical graduates to undertake General Practice. In 2005, Harris et al examined the factors influencing the choice of specialty of 4259 Australian medical graduates. The study showed that 79% of graduates considered their own skills and aptitude to be of importance when selecting General Practice. Personal satisfaction was also linked to choosing General Practice as a specialty. Laurence and Elliot supported this in their 2007 study which concluded that personal satisfaction arises from procedural skills, activities involved and patient contact. All of the 54 Pre-Registration Junior Medical Officers (PMJOs) interviewed in South Australia, agreed with this however, this was only a small sample size. Gender has been shown by studies to be a vital influencing factor for Australian medical graduates when choosing General Practice as a speciality. Whilst the responsibilities of raising children have evolved over the past few decades, Prideaux et al found that Australian female medical graduates are more likely to become specialists in General Practice due to child bearing responsibilities and family commitments. It has been noted the Australian literature that female doctors tend to work shorter hours and have a preference for working shorter hours due to family commitments. Despite this, there has been a rise in male doctors choosing to work fewer hours due to family reasons. This reflects the fact that both partners now commonly work. Lifestyle plays the greatest role in influencing medical graduates to choose particular specialties over others. Laurence and Elliot found that 100% of the 54 South Australian PMJOs interviewed regarded lifestyle as a vital factor in choosing General Practice as a specialty. This included hours worked, stress, career potential and potential for travel (55%). Most participants described their ideal job as having shorter working hours and less time on call. Most PMJOs also wanted a certain amount of control over hours and hence chose anaesthesia and GP practice. Wanting a life outside of medicine (85%) for example, spending more time with family and friends was also important. Similarly, Harris et al also rated extrinsic factors as the most influential factors of choosing a medical specialty in Australia. Seventy two percent of the Australian medical graduates viewed work culture as important, while 56% prioritised flexibility of working arrangements and hours of work. In contrast, Thomas concluded that only 28% of Australian medical graduates saw work life balance and lifestyle as important to selecting General Practice as their specialty. However, this study had a small sample size and focused on only one speciality (General Practice). Location is of importance when choosing a medical specialty. Stagg et al found that key influences on choosing a rural pathway specialty were mentors and undergraduate rural exposure. In contrast, Ward et al, in a longitudinal study that followed 229 UWA medical graduates, showed that a rural background is the most important predicator of rural general practice. Clearly, there factors that influence an individual to undergo a rural generalist pathway are multifactorial and more research is needed in this area. This literature review has a number of limitations. Firstly, this review was limited to articles concerning the Australian medical workforce. This review excluded international medical graduates, which may have given greater insight into the factors influencing the specialty choice of graduates. A comparison study could be done in the future, comparing the mindset of Australian medical graduates to overseas graduates. Secondly, whilst certain conclusions can be made concerning the factors which influence choice of General Practice as a specialisation, this review did not focus on the factors that influence doctors to change specialties or even the percentage of medical students that graduate without having made a decision about their future career. Research on the factors influencing General Practice specialty choice could be improved by including a larger number of schools and students, studying trends over several years, and using validated measures and outcomes. I was given the opportunity to conduct this research through the GPSN First Wave Scholarship and Tropical Medical Training (TMT). I am thankful to Dr. Aileen Traves who provided me with support, encouragement and feedback throughout the course of this review. Ellsbury, K. E., & Stritter, F. T.. A study of medical students’ specialty-choice pathways: trying on possible selves. Acad Med. 1997; 72, 534-541. Zurn, P., Dal Poz, M. R., Stilwell, B., & Adams, O. Imbalance in the health workforce. Hum Resour Health. 2004; 2(1), 13. Harris, M. G., Gavel, P. H., & Young, J. R. Factors influencing the choice of specialty of Australian medical graduates. Med Educ. 2005; 183(6), 295. Stagg, P., Greenhill, J., & Worley, P. A new model to understand the career choice and practice location decisions of medical graduates. Rural Remote Health. 2009; 9(4):1245. Thomas, T. Factors affecting career choice in psychiatry: a survey of RANZCP trainees. Australas Psychiatry. 2008; 16(3), 179-182. Belfer, B. Stress and the medical practitioner. Stress Medicine. 1989; 5(2), 109-113. Prideaux D, Saunders N, Schofield K, Wing, L, Gordon J, Hays R, Worley P, Martin A, Paget N, ‘Country report: Australia’, Med Educ. 2001;35:495-504. Dunbabin, J., & Levitt, L. (2003). Rural origin and rural medical exposure: their impact on the rural and remote medical workforce in Australia. Rural Remote Health, 3(1), 212. Joyce, C. M., & McNeil, J. J. Fewer medical graduates are choosing general practice: a comparison of four cohorts, 1980-1995. Med J Australia. 2006;185(2):102. Mowbray, R. Research in choice of medical speciality: A review of the literature 1977-87. Aust NZ J Med. 1989;19(4):389-399. 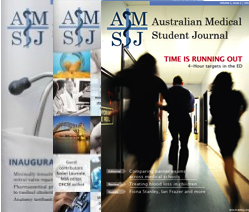 Joyce, C. M., Stoelwinder, J. U., McNeil, J. J., & Piterman, L. Riding the wave: current and emerging trends in graduates from Australian university medical schools. Med J Australia. 2007;186(6): 309.